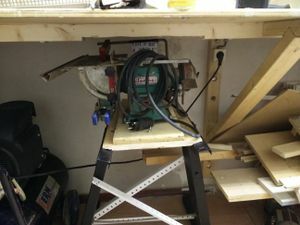 user:Branko donated a circular saw to Techinc a year ago. We used it to cut the laminate flooring for the dirty room expansion, but it needed some love to get it back in a good and safe(r) state. Purchased a larger, fine-toothed saw blade for it from Eco-tools. The original blade was too small for the machine and completely blunt. Soldered the broken holder of the saw protection lid and bent/adjusted it to sit correctly over the saw blade. Design a better system to attach the metal grille protection. Now I use a temporary clamp to hold it in place. This page was last edited on 17 August 2016, at 17:42.